Begin by speaking to Senliten in her tomb south of Uzer. To start the quest, speak with Senliten in her tomb south of Uzer. 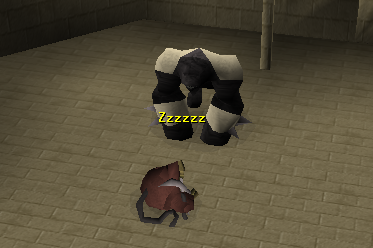 She will tell you a story of a time when monkeys lived within the forests of the Kharidian Desert. You will inform her that the monkeys no longer live in the desert, and she will become upset that you sound unconcerned. She will then send you to the Sphinx and Jex in Sophanem to learn about the Ape Goddess, Apmeken. Speak to Jex outside the temple to the lesser gods. Ask him about minor gods first, then all of the questions about Apmeken. In order to get the Sphinx to talk to you, you need a cat or kitten out. After the short intro with your cat, ask her about the minor gods, then ask about Apmeken. After speaking to both informants, head back to Senliten and inform her of what you've learned. She will tell you that the desert needs wild monkeys in it to preserve the desert's health. Head to Ape Atoll with any greegree, a m'speak amulet and at least 10 coins. You only need the coins if you don't have a M'amulet mould. Go to the monkey temple and speak to any of the three wise monkeys. They will suspect you of being human. Admit that you are and they will ask you to prove it, but there's a problematic guard watching. 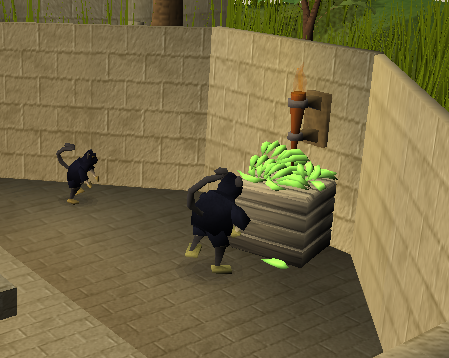 Using bananas from a crate on the far side of the temple, you must make a path of bananas that leads to the crate. Leaving the bananas in one spot too long will cause them to rot and disappear, and if they are placed more than three squares apart, the monkey will not be attracted to the banana. Putting a banana too close to a gorilla guard will cause him to eat it. It is easiest to pre-place certain bananas to make your job easier. Green squares indicate a pre-placed banana, blue squares indicate the second round of bananas. You will need about 18 green bananas (more or less may be needed depending on where you drop them). Setting up the bananas must be done quickly or they will rot and the monkey guard will return to the three wise monkeys. Note: The gorilla farthest south is me, not a guard you need to worry about, the red square is the banana dropped that will cause the guard to start his trip, after dropping the banana on the red square, move to the blue ones. The monkeys will suggest you go to the king and request to set up a colony. 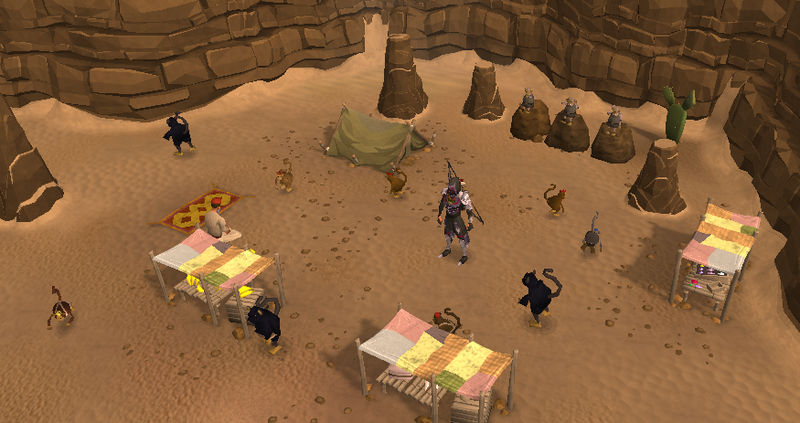 Your character will insist on the desert while he insists on Karamja. Say the desert has choc-ice to trade and he will consider the idea if you bring him some choc-ice in the shape of a monkey. At this point, you may want to go to the monkey child's house to pick 10 bananas. 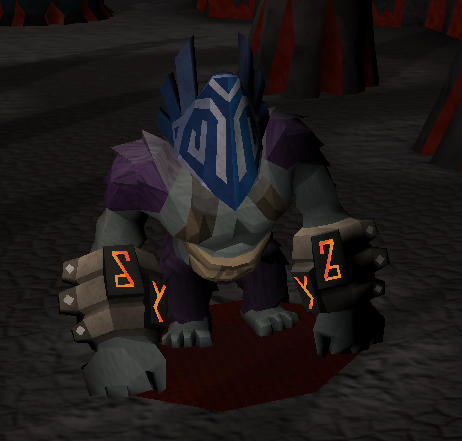 Head to Nardah and speak to Rokuh about King Awowogei's chimp-ice with 1,000 coins and a M'amulet mould in your inventory. If the chimp-ice melts, you will have to buy another one from Nardah for another 1,000 coins. Transporting the chimp-ice is a bit of a challenge. It will begin to melt after a short amount of time, so you will have to constantly cast an ice spell from the Ancient Magicks set on it. The higher level the spell, the longer the chimp-ice will stay frozen. It is recommended to cast your ice spell on the chimp-ice when you get the message in the chat box, "Your chimp ice is beginning to melt." To cast a spell on the ice, click "place," then cast your ice spell on it. Note Once you reach Ape Atoll, Lumdo will supply you with more chimp-ice if it melts. His replacements are free. Most forms of transportation will destroy the chimp-ice. Modes of transportation that do work are eagle transportation systems, magic carpets, balloon rides, and walking. The best way to transport your ice is to head to the eagle's lair north of the Uzer hunter area, pick up a rope that spawn in the lair, and take a ride to Eagle's Peak. From there walk along the side of the Gnome Stronghold until you reach the gate. Then head to Daero, speak to him, then speak to Waydar, then Lumdo. Bring food and anti-poisons as you will be on Ape Atoll in human form. Run along the north coast of the island until you are just outside of Awowogei's hut. Turn into monkey form immediately after freezing your ice right outside his hut. Pass the guards and talk to him. If you cannot use the Eagle system, take the magic carpets to the Shantay Pass and tell Shantay you're an outlaw. You will then be sent to Port Sarim jail. From there, charter a ship to Port Khazard. Walk the rest of the way to the Stronghold, then follow the same directions starting with Daero. The King will be so pleased with the ice, he will unquestioningly give you a barrel of monkeys to bring to the desert. Head back to the three wise monkeys to inform them that the King has granted you permission to build a desert colony. They will get in your barrel and tell you to bring them to a "place between the camel's humps." 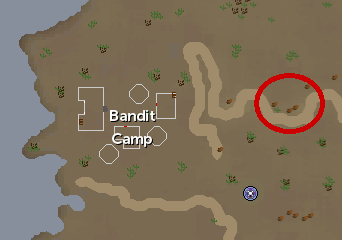 This location is East of the Desert Bandit Camp. Head east from the camp following the ridge. The location of the camp is where the ridge makes its second dip south. The red circle on the map below indicates where the colony should be. Once you release the monkeys from the barrel, they will ask to be part of the magic carpet network. They will suggest speaking to Ali Morrisane. Go to Al Kharid with a Ring of Charos (a) equipped and speak to Ali. Ali will set up a carpet route for you if you can find five metal crates that were lost in a sandstorm. He suggests speaking to Ava in Draynor Manor. Go to her with Ava's Accumulator and the metal crate. She will upgrade it, then ask you to test it. Get a spade from the mansion's other room and search the grounds for the crate. When the chicken bawks four times, you are above a crate. The crate is close to the fountain in the southwest of the grounds. After finding the crate, report back to Ava. Now you must search the desert for the five crates. The crates' locations vary by player, but are in the general area of the map below. Note, when digging up a crate, a level 72 small scarab may attack. You must kill it before you can dig up the crates again. After digging up the crates, bring their contents back to the wise monkeys. Now that you've set up a carpet business, travel to and from the monkey colony is much easier. The monkeys even let you travel for free! Despite the handy carpet service, no one is interested in visiting the monkeys. One of the wise monkeys will give you a book telling you how to start an economy. Clear the rubble around the colony with a spade. You will need to build three stalls to hold goods. Each stall requires two teak planks and two bolts of cloth. In one stall, put the gems you found in one of Ali's crates. In another, put ten bananas. In your third stall, three full waterskins, three knives and a full set of desert robes. For the final part of your economy, you need a tent. This is made with four bolts of cloth and a rope. To build each of these, a knife, hammer and saw are needed. The monkeys now feel defenseless. They will request that you steal six monkey knives from the King's elite fighters. Head back to Ape Atoll with a gorilla greegree and some food and head to the building east of the monkey child's house. Knock out and pickpocket the knife fighters until you get six monkey knives. Return to the wise monkeys with the six knives. They will tell you everything is fine and dandy now. Return to Senliten to tell her the good news. Returning to Senliten will reveal that everything is not fine and dandy, and that something is wrong in the colony. Return to the colony with a Ghostspeak amulet and M'speak amulet to find the colony has been totally eradicated. Inspect the corpse of a monkey to make a ghost monkey appear. Try speaking to him to find that it is impossible. Use one of your amulets on the other to create a cramulet. Speak to the ghost monkey again to reveal that the three wise monkeys have been taken by three masked butchers. 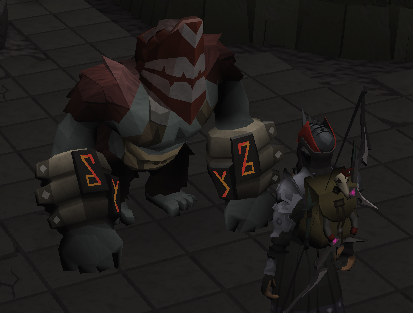 The first monkey was taken to the Pollnivneach Slayer Dungeon and is being held captive. Gear up for a tough fight. Your first battle is with Leeuni, who uses a powerful magic and melee attack. Being in the Pollnivneach Slayer Dungeon, you need a slayer helm or masked earmuffs to survive. Leeuni is located in the same room as the Banshee Mistress from Smoking Kills. Her magic attack is much more dangerous than her melee attack, so protect from, or Deflect Magic is recommended. Protection prayers will not totally block her attacks though, just lower the damage you take. Throughout the fight she will try to unequip your slayer helm or masked earmuffs. If she does, quickly re-equip it. If your inventory is full and she cannot unequip your helm, you will take 300 damage. Wear strong melee armour to better protect you from her melee attacks. Fill your inventory with high healing food, like monkfish or sharks, a special attack weapon and a prayer potion or two. Bring a quick teleport item if you're nervous about dying, too. After the fight, Apmeken will appear to you and say that "she" stole Apmeken's voice. Speak to Iwazaru and you will be returned to the monkey colony. Speak to the ghost monkey again and he will tell you he has found the next wise monkey. 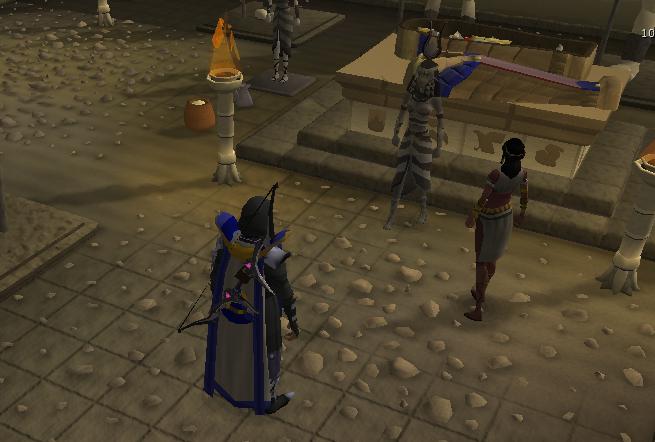 He is trapped by Ayuni in the Kalphite Lair. 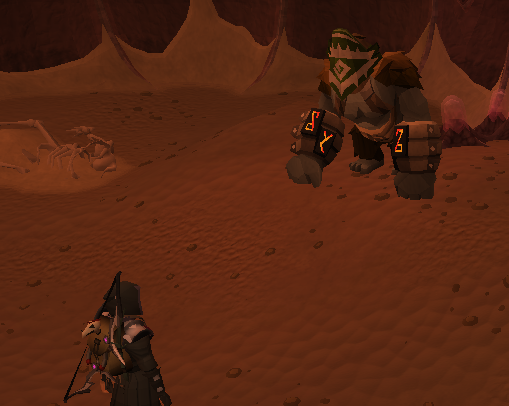 Since the Kalphite Queen or one of her Guardian's will likely hit you, it is a good idea to bring along an antipoison. Ayuni is best ranged as she has a very powerful melee attack that can deal huge damage and drain prayer. Praying against ranged attacks while hiding in the safe spot will make the battle much easier. Just like Leeuni's magic attack, Ayuni's ranged attack can hit through prayer with reduced damage. Ayuni moves very slowly, so she isn't difficult to escape from if she gets near. A hit and run tactic with ranged works best. Run around the room and attack her when she is far away from you. Bringing a few prayer potions is a good idea in case she melees you. Apmeken will appear again after the battle and explain that "she" stole her sight as well. Speak to Mizaru to return to the monkey colony. Speak to the ghost monkey a final time to find out the location of Kikazaru. He is in the ruins of Uzer somewhere. Go through the demonic portal to where you fought Agrith-Naar during Shadow of the Storm. Eruni will be here for your final battle. Eruni has very similar attacks to Leeuni, so the same or similar equipment should be taken. A slayer helmet or masked earmuffs are not needed, however. Pray against magic for the fight. At the start of the fight, Eruni will summon a lesser demon, at 3/4 health, Eruni will summon two lesser demons, at 1/2 health, she will summon three lesser demons and at 1/4 health she will summon four lesser demons. These demons have no special powers compared to other lessers, but they must be defeated at each stage before you can damage Eruni. While killing the demons, you can hide behind the pillars in the room to avoid Eruni's magic attack. Again Apmeken will appear at the end of the fight, this time telling of how "she stole all sound." Speaking to Kikazaru will bring you back to the colony where you will finally get things explained. 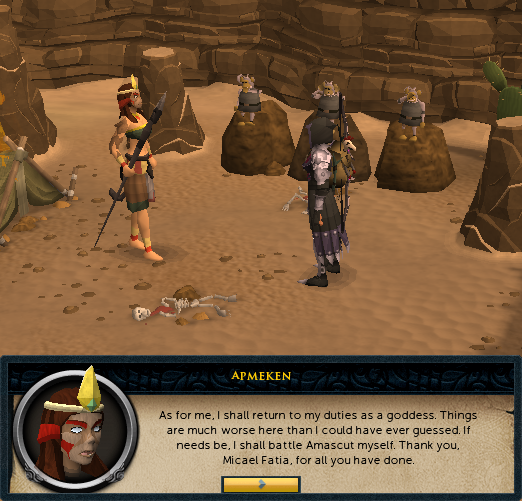 Apmeken will explain most of the quest's events along with some back story of why she abandoned the desert. You will have a short chat with the three wise monkeys, after which you will rebuild the colony. [^] Speak to Jex and the Sphinx. [^] Speak to the three wise monkeys. [^] Lure away the monkey guard. [^] Take off your greegree, speak to the wise monkeys, re-equip your greegree and talk to them again. [^] Speak to King Awowogei. [^] Bring the monkeys to the desert. [^] Speak to Ali Morrisane. [^] Recover the test crate. 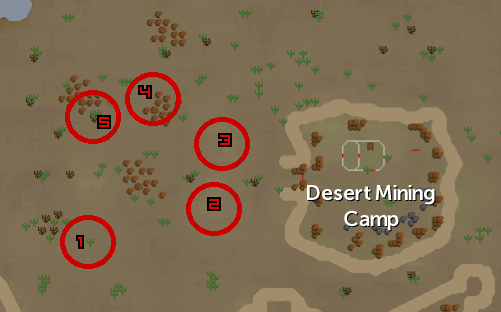 [^] Recover the five crates in the desert. [^] Bring the rugs from the crates to the wise monkeys. [^] Build the colony and fill its stalls. [^] Pickpocket six knives from King Awowogei's fighters. [^] Speak to the wise monkeys. 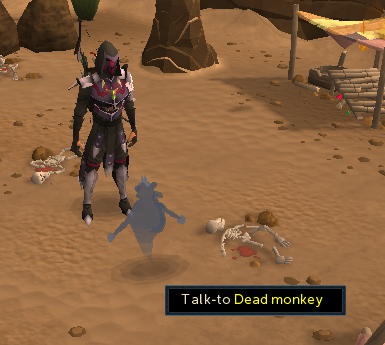 [^] Investigate a corpse at the colony and talk to the ghost monkey. 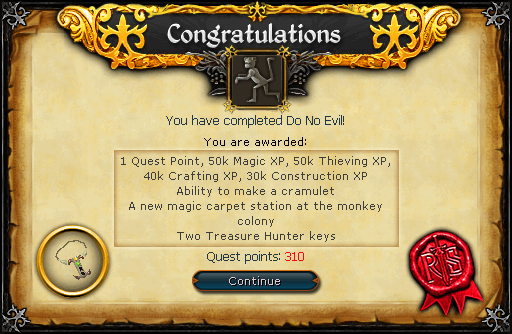 [^] Create a Cramulet and speak to the monkey again. [^] Kill Leeuni and rescue the first monkey. [^] Speak to the ghost monkey. [^] Kill Ayuni and rescue the second monkey. [^] Kill Eruni and rescue the third monkey.